futurebit puzzle is a simple but colorful jigsaw puzzle game that can turn your favorite .bmp and .jpg files into solvable puzzles. 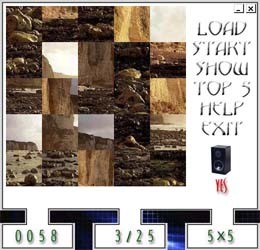 You simply load an image, choose a piece size from 3x3 to 8x8, then use drag-and-drop to move the pieces around and solve the puzzle. futurebit puzzle maintains the top five scores, lets you take a peek at the finished puzzle for a hint, and displays the elapsed playing time and the number of pieces correctly placed so far. futurebit puzzle is a simple, fun program that can be made easier or harder by the number of pieces and the type of image you choose. THIS PROGRAM IS ADVANCED VERSION OF BitMap Puzzle.